Bibleham is a beautiful, comfortable and cosy country cottage in one of the most scenic parts of South East England, ideal for a relaxing vacation. Private and secluded off a country lane with very large gardens and magnificent views. It sleeps up to 8 adults in 4 Bedrooms. There is parking on the front. Low beamed ceilings and antique furniture. Oak panelled dining room . Fully equipped kitchen with electric oven/grill, ceramic hob, microwave, dishwasher, table with pew. Adjacent hall/store room with with Belfast sink, larder cupboards, 1 large fridge. A large utility room with Table Tennis table, freezer, washing machine and tumble dryer. Spacious Sitting Room with spectacular 15th Century inglenook fireplace, large settee, several armchairs and CD/radio player. A separate lounge/snug with 42 inch flat screen TV, DVD and large L shape sofa. There is a lovely barbecue and sitting area outside for the warmer months, with a firepit available as well. There are two bathrooms upstairs - one with a bath and the other with a power shower. There is also a downstairs loo. 4 nice bedrooms upstairs, 2 with king size double beds and 2 twins. The garden is really well kept, with lots of different garden sports equipment to keep everyone entertained. There is a large swimming pool at the bottom of the garden which is heated by an air source heat pump, so if it is hot outside, it tends to be warm enough in the late Spring, Summer and Early Autumn months when we open it for use. There is also a large swimming pool hut for changing, and the big room has a full sized pool table requisitioned from a pub so a good quality table. If you want to venture out for walks, the owners have mapped a few nice ones of different distances, or you can just walk as it is all beautiful in the area - with lots of woods, lakes and public footpaths. The nearest village is Mayfield, and that has one of the best restaurants in the area - The Middle House. It has several others as well, and is one of The Times villages of the year for 2017 - a very attractive place. We can supply a travel cot if needed. Bibleham ist ein wunderschönes altes Haus, das liebevoll eingerichtet ist und trotzdem mit allem Notwendigen, insbesondere auch allen modernen Geräten (Waschmaschine, Geschirrspülmaschine, Toaster, Mikrowelle, Föhn, großer Fernseher in schönem seperaten Raum etc.) ausgestattet ist. Den Grill und die Terasse konnten wir dank des schönen Wetters viel benutzen. Die vier Schlafzimmer sind schön und die Betten sehr bequem. Gerade sehr große Menschen müssen im Haus ein bisschen aufpassen, da die Türen und Balken teilweise ziemlich niedrig sind. Der Garten ist parkähnlich groß und sehr schön angelegt. Das Schwimmbad ist zwar nicht mehr ganz neu, aber sauber und herrlich in die Landschaft eingebettet. Sensationell ist auch das extra Häuschen am Schwimmbad mit Billardtisch. Auch Tischtennis, Krokett und Federball sind vorhanden- ein Traum für Kinder! Das Haus liegt ganz auf dem Land, ist aber sehr zentral gelegen, um Südengland (Kent, East Sussex) zu erkunden. Der kleine Ort Mayfield ist in wenigen Autominuten erreichbar und hat gute Restaurants und einen kleinen Laden. Viele Sehenswürdigkeiten sind in ca. 1 h zu erreichen. Auch der wunderschöne Sandstrand von Camber Sands ist nur 45 min entfernt. Die Kommunikation mit den Eigentümern ist sehr angenehm, schnell und unkompliziert. Wir haben zwei traumhafte Wochen in Bibleham verbracht und können das Haus ohne Einschränkung weiterempfehlen!! Thoroughly enjoyed our 4 night stay which included a bank holiday weekend - yet delightfully peaceful and quiet. The extensive grounds and facilities were ideal for our grandchildren. The swimming pool was a winner!...and we didn’t have to worry about the children making a bit of noise as there was no one nearby. Nobody wanted to stray far from the house (apart from some walking) as everything was to hand for an enjoyable family time. The house is well equipped and indoor games included a pool table and table tennis. Our hosts Melanie and Phillipa provided all we needed for our stay. Two families had a fantastic weekend at this magical historic property. Enormous garden that we enjoyed despite the blizzard conditions! Great pub in the nearby village. We spent a week at Bibleham and it was gorgeous! A perfect location for 4 adults, 2 toddlers and a baby. The kids loved playing in the garden and the pool was perfect for the warm weather. The outdoor grill allowed us to dine al fresco. You do need a car as it is not walking distance to the High Street. It was a great place for us to have a family vacation. The only thing we can really complain about is the wi-fi. It is extremely limited and that was a bit difficult for us as we travelled from the States and Australia. It was needed for purposes of talking to family and checking in with work on things and the limited wi-fi made it diffcult to do so. Otherwise, everything was great. Enabled us to have a peaceful time with family and friends. Excellent accommodation and equipment in a beautiful setting. Beautiful home and garden in stunning countryside. We couldn't have asked for more from the property. The location is gorgeous and the local walks were great for our group. The kids enjoyed all the sports equipment (croquet, badminton, table tennis, pool table, swings, trampoline....). A fantastic weekend. 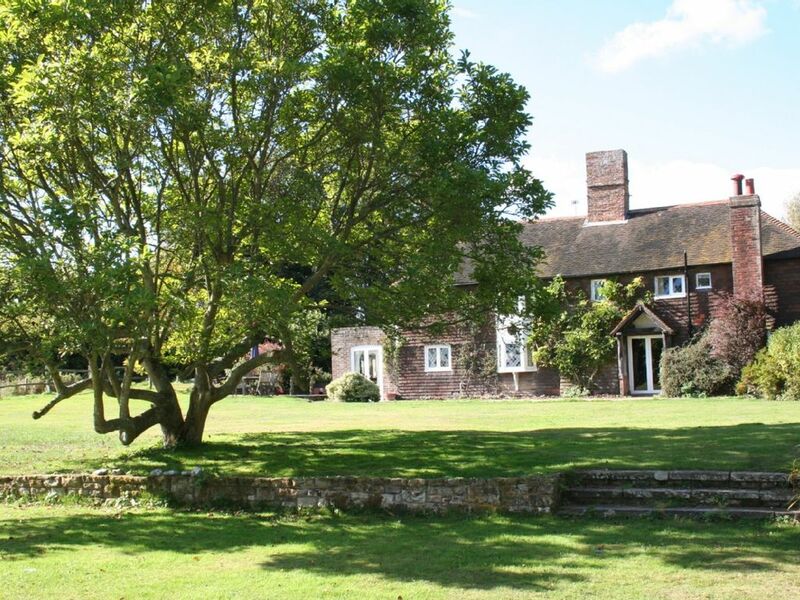 Bibleham is set in beautiful countryside near Mayfield, with breathtaking views over the Weald. It is 2.5 miles way from the historic town of Mayfield which has a traditional high street full of shops selling local produce. There are also a number of pubs and restaurants. The countryside is ideal for walking, cycling and horse riding. Also nearby is Bedgebury Pinetum (with great adventure trails, Go Ape and bike hire), the Cuckoo Trail, Bewl Water (perfect for watersports and hiring bikes), The Bluebell Railway, The Enchanted Forest, Drusilla's Zoo and many more attractions. The coast is also a mere 30 minutes away. N.B. WEEKEND RATE IS CHARGED AT 75% OF WEEKLY RATE FOR STAY OF 2 NIGHTS MINIMUM. If more nights are required we add £75 per night up until and including 4 nights. FYI: THE ADDITIONAL NIGHT CHARGE ON THE WEBSITE IS WRONG. For 5 nights we charge the weekly rate. Bed linen and hand towels are included. You will need to provide your own bath towels. If you would like to supply your own bedding we will reduce the rental rate by £50. There are 2 ways to pay either by bank transfer direct to us or by credit card through the Homeaway website. Please note if you pay by credit card you will incur a service charge.